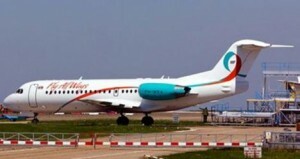 PARAMARIBO - Start up Suriname-based airline, Fly Allways, following years of setback towards certification to fly, apparently now faces dark skies ahead. With creditors awaiting payments, poor payloads, and one of its two Fokker 70 aircraft being used as a source of spare parts to keep the other one flying, Fly Allways faces an alarming financial future. With creditors and personnel now facing delayed payments and salary cuts, the future looks grim. Management is reportedly considering whether a move to another Caribbean Community (CARICOM) country is possible. “Pilots have had to accept a major pay cut or leave,” our source said. “The load factor between Suriname, Guyana and Barbados is below 30 percent. Between Barbados and Guyana an average of 20 seats are occupied. Plans to commence service to Haiti have been cancelled,” confirmed a second source.